In an attempt to make reefing go faster, I've made a few minor changes. Snotter. Up till now, I've simply tied the snotter around the mast. There is a spring clip tied to the end of the boom which clips to the snotter. 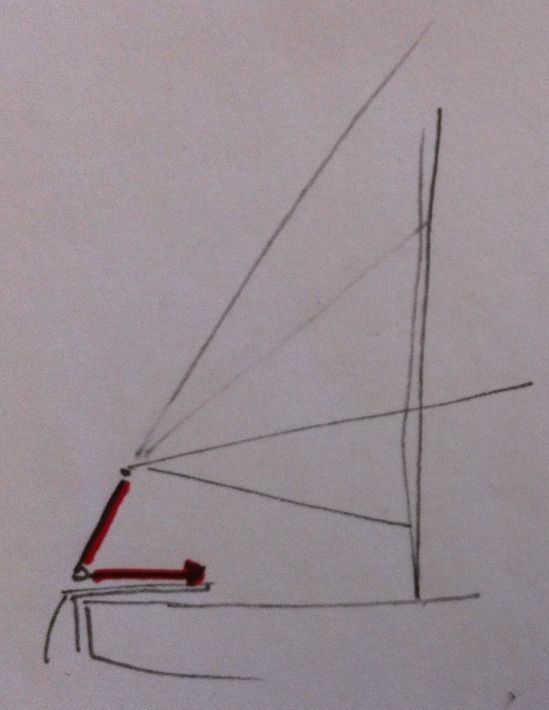 This is a simple system, but it gets fouled with the sail lacing when raising and lowering the sail to reef. The new arrangement uses a ring tied to the mast. The spring clip is now clipped to the ring and tied to the snotter. Downhaul. I also got a larger hook for for my downhaul which is easier and faster to fasten. 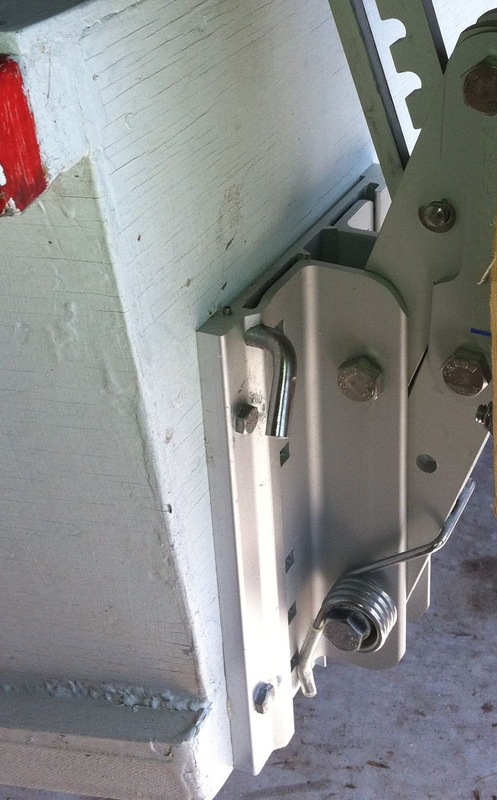 I did a few reefing drill with the new rig in my driveway: the best I could do was about six minutes. On the water, it will probably take closer to ten minutes. The results are a bit disappointing, but I think the procedure will be safer and more reliable with the latest changes. Last trip we got a lot of water in the cockpit through the oar ports when it was blowing and choppy. I made two covers for the oar ports to keep the waves out. 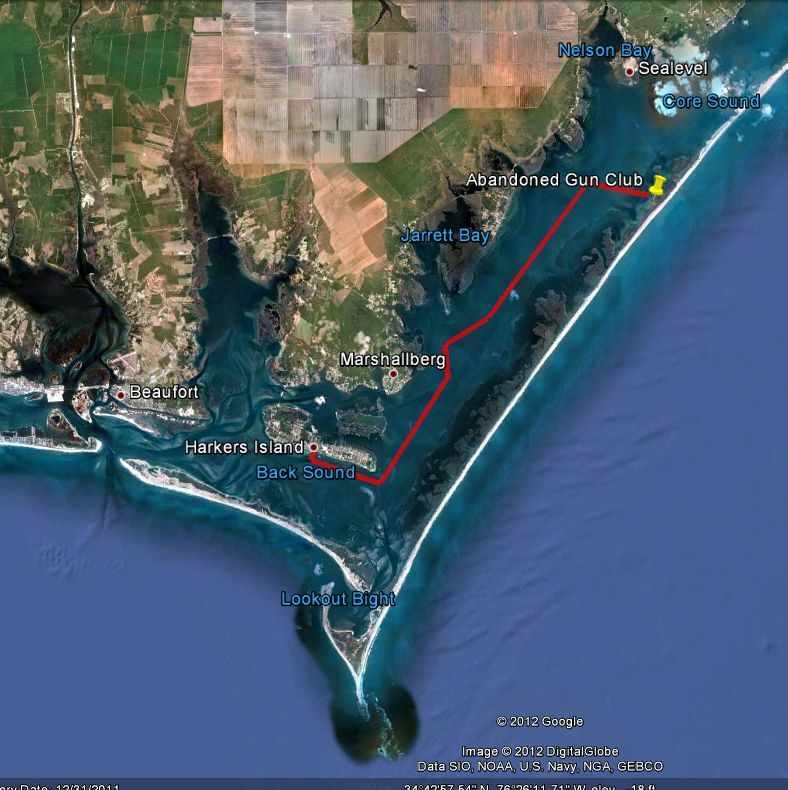 After spending 3 days on the barrier island called South Core Banks, we were ready to head southward. Unfortunately, the favorable NE wind from the day before had turned into a strong SW with a forecast for 20 mph winds, gusting to 30. We took one more long walk on the beach, packed up and stowed our stuff, got into our foul weather gear and headed out. After bumping a few times in the shallows near the duck blinds, we made it into the channel and started slogging our way upwind. 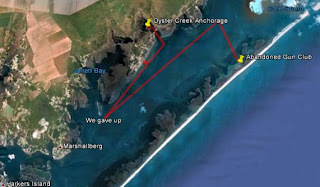 We had some vague hope of possibly making it to Shackelford Banks with the help of a favorable wind shift, but after four hours of pounding into the steep chop, we turned around and headed back north, intending to anchor in Oyster Creek, just north of Davis. I was very proud of how well Cream Cheese had done, but we we weren't racing and Oyster Creek seemed like a nice place to investigate. On our way, we beached the boat at the Davis Ferry terminal and took a walk around, stopping at a little tourist shop to wash up and have some coffee. Back to the small beach near the ferry terminal we lowered the mast and lashed it on deck. The entrance to Oyster Creek is spanned by a 10' clearance highway bridge, so we knew we would have to lower the mast sometime. We powered out into the channel, made our way to the mouth of the creek (sometimes surfing with the breaking waves) and scooted under the bridge. The water in Oyster Creek is 1 to 2 ft but we were near high tide so we followed crab pots deep into the creek and nosed into the bank of a levee. On the windward side of the levee, the wind was howling and on the leeward side the waves were frothing up just yards from our stern, but it was snug and calm in the wind shadow of the levee. Picture taken from the levee road. The shores of the Core Sound are carved up by hundreds of uniform, straight canals. In Louisiana, we call canals like these trenasse and they are usually cut by duck hunters or oil companies. There were a number of trenasse near the levee. The levee encloses an irregular pond of about one square mile that borders the creek. The canals are cut outside of this area except where they seem to pierce it (below). I would love to know more about these structures and their purpose. Perhaps the pond is/was some sort of fish farm? Maybe the canals are for flood control, but if so, why does their shape pierce the pond? Are there submerged pipes? 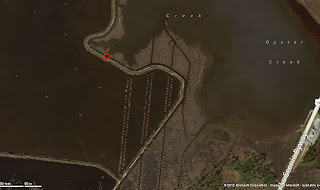 Maybe the pond was built after the canals and the small bunches of grass (dots on the picture) are just left over spoil? No one I asked could tell me. After setting up our tent, we took a long walk on the levee road, had a quiet meal and settled down for the night. All week we had been reading aloud to each other the book Persuasion, by Jane Austin and this night we finally finished it. (Spoiler alert) The heroine marries well, and all difficulties are resolved. After being boarded on the first night by Racoon 139, I decided it would be best to move the boat away from the bank a bit, so I used the second anchor to draw is into the canal a bit. The next morning, we got up early to beat the low tide but almost missed our window. 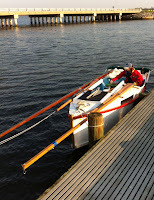 We just barely got out of there by sliding Cream Cheese along the mud and polling with our oars. After passing back under the highway bridge, we stopped at a well maintained boat ramp to raise the mast, make tea and have breakfast. Our plan for the day was to return to Harkers Island Fishing Center so that we could drive home to Pennsylvania the next day. We had a lovely sail in much more variable wind conditions. We started the day with one reef but added a second reef a few hours later. Then the wind dropped to almost nothing so we shook out both reefs. Later the wind picked up to 15 mph and shifted to the south so we went back to two reefs on an upwind beat, still very comfortable. Each time we reefed, it took 10 to 15 minutes to get going again and we usually lost a lot of headway as we drifted downwind. Much of the time was spent dealing with the snotter, downhaul and lacing. I've got plans to change things to make reefs go faster. At around 4:00pm, we sailed into the marina, retrieved and cleaned the boat and took long hot showers. 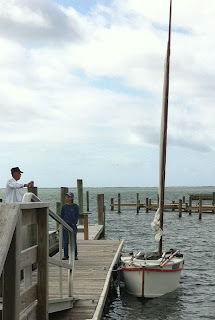 That evening, we visited with John, a retired relative of the marina owner. He helps out with the business and lives in his fifth wheel RV which he keeps parked right at the edge of the shore overlooking the sound. It was a fun time - learning about his life growing up on Harkers Island and his life in the oil business. If we return to the area, we will try to get in touch with him again. The next morning on our way home we stopped at B and B Yacht Designs to talk to Grahame Byrnes about his small boat designs. We had a fun and interesting visit with Grahame. He gave us a tour of a big power catamaran that he is building (around 40 ft) and we saw his Core Sound 20 and his Everglades Challenge 22, Southern Skimmer. He demonstrated his precision cut panel kits and showed us the drawings for a new update to the CS 20 with cuddy, self draining cockpit and water ballast. He later sent me an email indicating that work on hull #1 is already in progress. I'm seriously thinking about building this boat. It was an awesome trip. The boat did well under challenging conditions. We had lots of adventures yet plenty of time to relax and when we arrived back home we were tired and happy. We had some great sailing. Sometimes it was too rough to capture video, but I did manage to get some footage in more moderate conditions. In March, our kids were scheduled to go on a week long service trip. Julie and I haven't been on an extended vacation on our own in a very long time, so we planned to go camping or dinghy cruising somewhere in the south, weather depending. I wrote about our preparations in Part 1. In February we had selected a few possible destinations including the Everglades, North Carolina and Virginia. As we approached our March 23 departure date, the weather was looking promising in the Core Sound of North Carolina's outer banks so off we went. 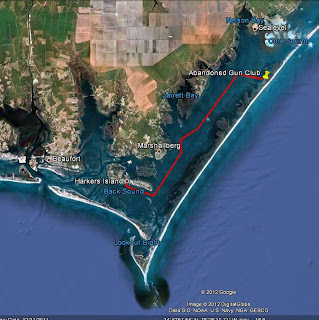 I contacted Steve Earley, whose blog has a lot of great information about dinghy cruising in the area. He recommended charts to use and possible launching sites. On March 23, we drove from Coatesville, PA to Harkers Island, NC, stopping on the way to pick up a Suzuki 2.5 HP engine at Eds Marine Superstore in Ashland, VA.
Our little sailboat looked totally out of place in the parking lot faced off against dozens of high end bass boats and sport fishing rigs. 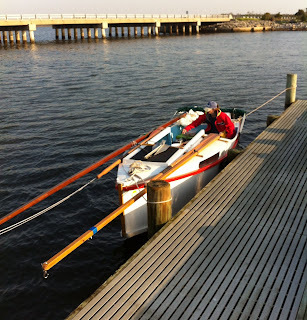 When we got to Harkers Island, we checked in to the Harkers Island Fishing Center, a boat storage warehouse, marina and no frills hotel right on the water. The marina and boat storage business was still closed for the season, but the motel was open. The rooms have painted cinder block walls and linoleum floors, but you can see the boat ramp from the window and they are very friendly people. The whole place was pretty empty and this characterized our whole time in NC. We were lucky to have good weather before everyone else arrived. We were told that last year in March, the weather was freezing, wet and stormy. During our trip we had lots of wind and a little bit of rain but the temperatures never got below 44 degrees at night or 58 during the day and most of the time we had afternoons in the 70's. The forecast for the next two days called for high SE winds, thunder and lightning so we decided to wait to begin our trip, instead visiting the maritime museum in Beaufort and doing other touristy things. On Sunday, there was a weather window between storm systems so we took the opportunity and at about 11:00 am we departed with a 15-20 mph south easterly. We sailed downwind for three or four hours with two reefs tied in, often in less that 12" of water. The boat draws only 6" so we were able to ignore lots of navigational aides and even sailed across some shoals at low tide. All of my modifications to Cream Cheese worked like a charm. food and kitchen are all securely stowed. More storms were predicted for the evening so we stopped early at the ruins of an abandoned hunt club. Distance 16 miles. This was a nice place to stop because it has an access road through the marshes linking the sound to the ocean beaches. As evening approached, we unstowed our gear and relaxed under the bimini and a small tarp. We took a long walk on the deserted atlantic side bach and made some dinner. For this trip, we brought a bunch of ready made indian food and rice dishes in sealed pouches. These meals were very easy to prepare and clean up and they tasted pretty good! Before going to bed, we tied on a more complete tarp to act as a tent. The tide went out, leaving the boat dry on the beach. We were awoken at about 10:30 pm by a racoon scratching around in the cockpit trying to get into our food bin. He wore a collar with a big yellow tag with the number 139 in large print. I looked at 139, he looked at me. I shone my flashlight at him, he looked at me. He wasn't afraid. I yelled at him for a while and he finally stauntered away. He came back one more time and hopped in through the oar port, but I shooed him away again. After that, the storm system came in and we didn't see 139 again. We had a very wet and windy night at anchor, but the cabin stayed dry. 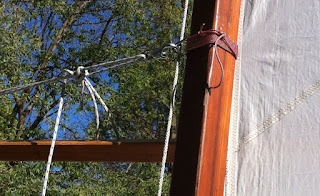 A wind shift from SE to NW meant adjusting the anchor arrangement twice (I had two anchors rigged). For a while there were 30+ mph winds from the East, blowing right into the anchorage, but Cream Cheese did fine and we slept well in between anchor adjustments. We decided to stay another day and had several great walks on the seaward side of the island. There were miles and miles of empty shore with nothing but terns, gannets, gulls, black skimmers, sand pipers, plovers, pelicans, cormorants. We had a beautiful evening with N winds at 10 mph. On the third day, my back was hurting so despite a favorable northerly wind 15 to 20 mph that would have taken us to interesting anchorages at Shackelford Island, we took it easy and relaxed while I could recuperate. After the first rough night, we had nothing but comfortable and pleasant sleeps. The tarp tent, aside from being, ugly, awkward to set up and a bit noisy, worked out very well and I am eager to fashion a real fitted tent out of good materials. During our stay at this anchorage, we only saw two people (from a distance) and three or four boats. My Father sent me this photo of The Drascombe on the beach of one of the spoil islands along the Intracoastal Waterway in the Indian River Lagoon. 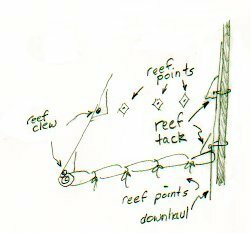 After recently spending a week in the unpredictable weather of the Core Sound of North Carolina's outer banks I've been thinking a lot about reefing. Here is an updated version of an article I wrote for Duckworks Magazine 12 years ago. If you've read it before, most of my updates are near the end. I've sailed small boats all of my life, but it was a long time before I started to think of reefing as an every day sail handling skill rather than an emergency tactic. When I finally did start setting my sails to match the wind conditions, it came as a revelation that heavy weather sailing doesn't have to involve acrobatic hiking on the windward rail or raw hands from gripping the sheet. In fact, I discovered that with good sail management, heavy weather sailing can be fun, fast and safe. Drascombe Longboat - A very seaworthy 21' open boat (doesn't point well). When my dad first got her, we didn't take advantage of the features of the sail plan and so we wound up hiking and heeling and burning our hands holding onto the sheets. I borrowed the boat from my dad for about 13 years and it was during this period that I really learned how to match the boat to the wind. I've done some silly things with this boat and sailed in some terrible weather in the Gulf of Mexico and the Chesapeake, but she has always brought me home, largely because of her sail rig. Side note: this boat is ample proof that an open, unballasted boat can be very seaworthy. 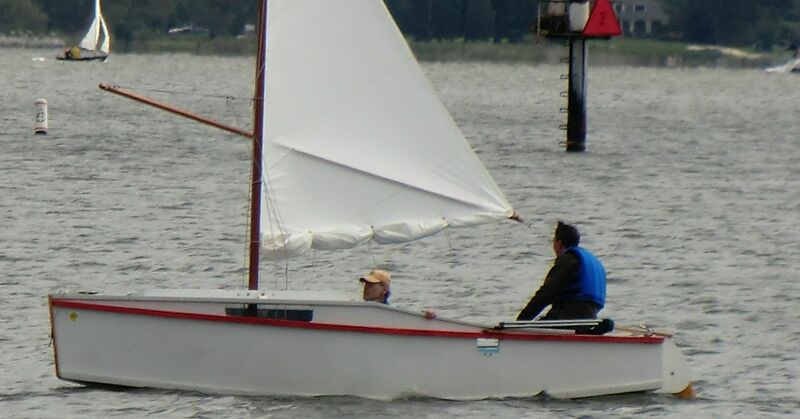 AF3 - an able little 16' sharpie skiff with a cuddy cabin designed by Jim Michalak (My current Boat). It has one sail with two rows of reef points. It took me about 170 hours to build the boat and sew the sail. We've had her out in 20 to 30 mph winds and had a wonderful time with no worries. On one windy trip in Nebraska with steady 25 mph winds, we had one reef tied in the whole time, sailing beam reaches or broad reaches. We would have had to tie a second reef in if we had needed to head upwind. It was nice to know we could get home even if the wind shifted. Jim Michalak has mentioned in his excellent essays that force on a sail is proportional to the square of the wind velocity. If the wind doubles from 5 to 10 knots, the force on the sail will increase by four times. This is the reason why reefing is so important. I found a description of a Scotland "Fifie" in John Leather's "Spritsails and Lugsails." It was used for fishing along the North Sea coast of Scotland around 1905 and had eight lines of reef points on the main and five on the mizzen. Other similar craft carried complete sets of smaller heavy weather sails for the same purpose. 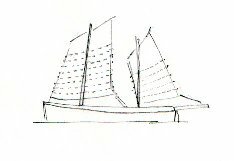 Howard Chapelle, in his "American Small Sailing Craft," describes how oyster and crabbing sharpies carried two masts with three mast steps. In light winds, both masts were stepped fore and aft. 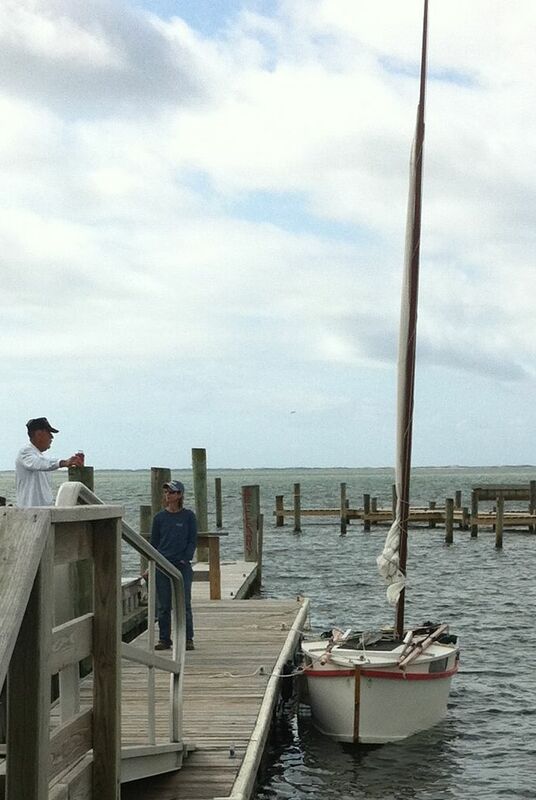 In heavier winds, a single mast was stepped in the middle mast step. Bluewater cruising literature is full of heavy weather sail handling information that, while not aimed at the small boater, is still relevant. For instance, cruisers seem to prefer cutters and ketches because their sail shortening options are better than with other rigs. 1) Does it work when you really need it to work. It seems to me every other emergency at sea story involves some sort of problem with reefing - either the furling drum has jammed, or sail doesn't come down etc. For this reason, I consider reliability more important than convenience when it comes to reefing. In the engineering world, "Mean Time Between Failure" is used as one measure of reliability. I would love to know the average MTBF for roller furling jibs at any given marina in the US. I bet it is a terribly low number. Among blue water cruisers, whose life depends on such gear, I am sure the number is much better. In most aspects of sailing, and particularly in reefing, the probability of failure is highest at the moment where the consequences are the worst (unlike my car, where the probability of failure is greatest when I go to start it). Generally, mechanical systems with fewer parts are more reliable than systems with more parts, so my personal bias is toward simple reefing systems. Complex systems can be reliable, but they are more expensive than simple systems and usually require more recurring attention in order to achieve that reliability. This is one reason why I like the old fashioned rigs like the sprit-boom and the loose footed main. 2) Does the boat sail well when reefed. I think a rig that is unbalanced or can't point under reefed sails is not much better than one with no reefing options. The whole point of reefing is to manage the boat so that you can get to where you are going in various wind conditions. 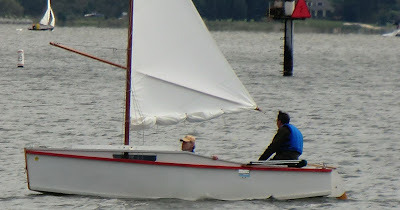 Besides being inconvenient, sailing an unbalanced boat in heavy weather is unsafe. The saying goes: "reef early and reef often." 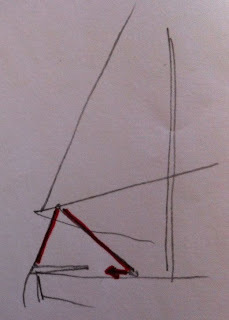 I find that above 10 knots, I adjust my sail area for every 5 knot increase in wind, depending on point of sail. 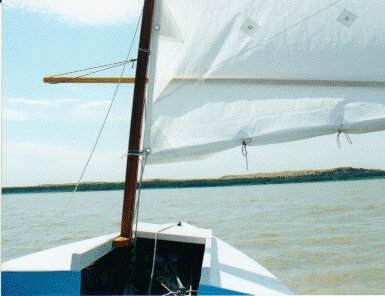 A small boat, especially an unballasted one, is more sensitive to sail area when going upwind, so I am more likely to reef if I have any upwind work ahead. I also think it is crucial to be able to reef while underway, even in a small boat. 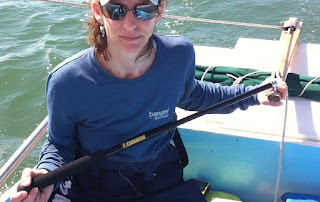 This may not be important for someone who will always be sailing within site of the dock, but I like exploring and going from place to place, so I need to know that I can get back home, even if the wind changes or picks up. "Swallows and Amazons," by Arthur Ransome talks about reefing: Mum quizzes her sons John and Roger on reefing the lugsail of the Swallow. Roger explains that you first tie the pendant nearest to the mast, then the one at the end of the boom, followed by the reef points in between. So far, after 26 years, that has been my only instruction! The Drascombe Longboat, which Phil Bolger would call a Jib Headed Gunter Yawl (see his book "103 sailing rigs, straight talk") has a roller furling jib, a loose footed main with two sets of reef points and a small balancing mizzen aft of the tiller. When reefing the main, I always lower the main completely. She is very well balanced under jib and mizzen alone, so if I have a crew, we keep going underway while reefing. If I am single handing, then I heave-to, drop the sail, free the mainsheet, free the downhaul and clip it to the first reef tack tie the reef points, clip the mainsheet to the reef clew, then raise the sail and continue on (I have stainless carbiner clips on both the mainsheet and the downhaul to make reefing easier). To heave-to, I back-wind the jib (sheet it in on the windward side), let the main sail fly loose or lower it, haul in the mizzen and put the tiller hard to lee. The result of all this is that the boat very gently drifts to leeward, keeping her bow about 30 or 40 degrees to the wind. Sometimes I heave-to to wait out squalls instead of running with the wind or heading in to shelter. My AF3 is a cat rigged sprit-boomed sharpie skiff. 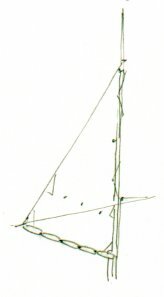 Chapelle indicates that early sharpies of the 1870's had vertical reefing, the sail being drawn up to the mast with brails. Later boats used horizontal reef points. 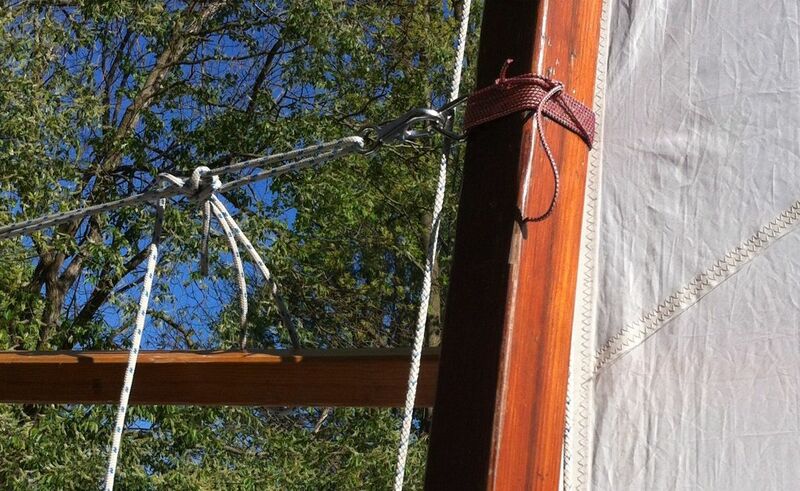 Jim Michalak has tried vertical reefing on his sails, but was unhappy with the results. I put horizontal reefs into my AF3 sail and so far, they have worked out very well. Some people do not rig a halyard on this type of rig. They simply leave the sail tied to the mast and roll it up when not in use. I have a halyard. 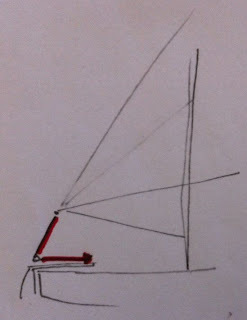 On some sharpie designs, owners reef by removing the sprit boom and roll the main around the mast. I haven't tried this on the AF3 but I suspect the upwind sail performance would suffer greatly because the absence of the sprit boom would ruin the sail shape. Since there is only one sail, there is no possibility of heaving-to or staying underway while reefing. There is, however a very nice cuddy cabin that gives the sail plenty of protection from the wind while I am tying the reef points. The laced on sail interferes with the snotter. I have to completely free the snotter from the sprit boom and thread it through the lacings before I can re-attach it to the boom. I have some ideas about improving the reefing time, but I think that reefing my AF3 will never be as easy as on the Drascombe. Graham Byrnes, designer of the Core Sound 20, which has cat-ketch sharpie sprit rig, told me that he can reef both sails in a few minutes. He attributed the ease of reefing to the inherent qualities of the cat-ketch configuration (similar to the Drascombe, the mizzen keeps things stable while you rig the main) and the fact that he uses sail track instead of lacing. I think the ability to effectively manage sail area, regardless of rig type, is a fundamental part of sailing and seamanship. For small boats, sail rigs with few moving parts and simple reefing schemes are safe, efficient and reliable.